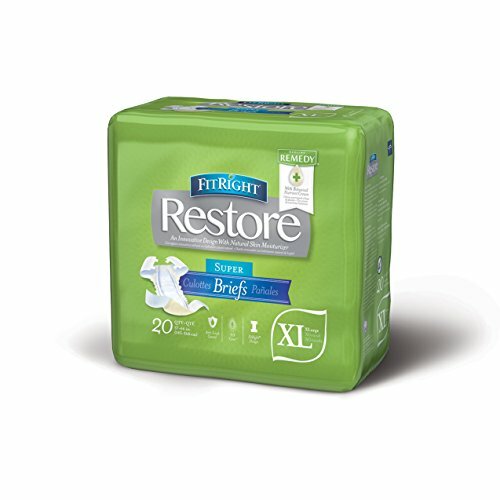 The FitRight Restore Brief addresses two major incontinence issues: the need to keep skin extra dry and the need to maintain skin integrity. To further help maintain skin integrity, a layer of Medline Remedy Skin Repair Cream has been laid into the brief-the cream contains a proprietary blend of antioxidants, amino acids, vitamins and dimethicone to help nourish and soothe fragile skin. Platinum Series 4D-Core with odor protection helps wick fluid away to lock in moisture and promote dryness. Breathable side panels increase airflow and maximize patient comfort. Moisture alert wetness indicator changes color when the garment has been soiled.